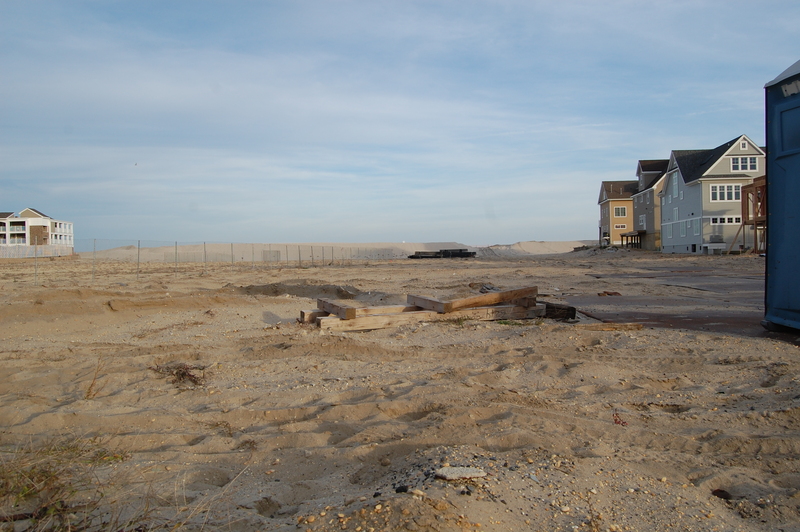 Just shy of the third anniversary of Superstorm Sandy, the Brick Township Board of Adjustment this week granted variances which will allow for the construction of 13 homes where 32 bungalows once stood. The homes formerly on the site, the southernmost portion of the Camp Osborn neighborhood, burned down during the storm following transformer fires that erupted and spread. The homes were privately owned, but sat on land that was leased by Bob Osborn, 78, a longtime Brick landowner who now lives in Maryland. Osborn will sell the property to the new owners of the homes which will be built, and no longer operate a land-lease business. The application has been before the planning board since March, and has been the subject of numerous hearings. The project was being opposed by homeowners on Lyndhurst Drive, the street which will back up to the new homes, who hired an attorney to mount an effort to have the application denied. The Lyndhurst Drive residents, whose homes are significantly larger than those proposed for the Camp Osborn site, said they believed the 13 homes would be too dense and said only four or five homes should have been built on the site. The hearings had been largely characterized by the flamboyant, though often confrontational, case presented by attorney Edward F. Liston, who had been retained by the Lydhurst homeowners who were objecting to the project. Liston often sparred with Board President Harvey Langer, and during some hearings was admonished by board attorney Jeanne Ann McManus over his questioning of witnesses and what his adversary, attorney John Jackson, claimed to be stalling tactics. The meeting this week was the first where members of the public could comment, with an about equal number of neighboring residents speaking in support of, and opposition to, the project. Throughout the case, most of the testimony centered on the density of the project. Osborn’s witnesses testified the number of homes on the plot of land would be reduced by more than half. Liston’s witnesses said that even though the property would not be as dense as it once was, the 13 homes were more than double what would be allowed under the township’s zoning for the lot. Brick’s R7.5 zoning applies in the area, which requires 7,500 square foot lots. The homes will be approximately 1,800 square feet, raised to meet flood standards and built on pilings that meet the standards of FEMA’s ‘V,’ or velocity zones, even though such a level of construction is not required, Jackson said. Jeffrey Carr, the project’s planner and engineer, told board members during the hearings that the development will include 24 foot-wide road made out of crushed clam shells in order to retain the beach styling of the neighborhood. Trucks, vehicles and cars can make a K-turn at the end of the road, where a “T” is formed, Carr explained, with ample room for delivery trucks, school buses, mail trucks and emergency vehicles to enter the neighborhood. The clam shell roadway would still be able to be plowed after snowstorms. Each home will have enough space to comfortably fit three cars in a driveway area and, depending on the size of the vehicles, potentially four cars, Carr said. 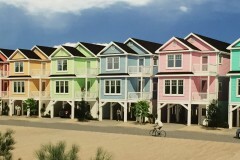 The homes will also have decks on the front and rear, and would have direct access to the beach. The 14 homes, designed by noted Brick architect Paul Barlo, will be part of a homeowners association that will be responsible for the main road through the development as well as community landscaping. The plan only includes the relatively small portion of Camp Osborn that Osborn owned under the land-lease agreement. 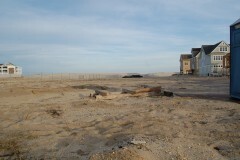 The remaining portion of the neighborhood, where about 70 homes were once located, is divided between two homeowners associations and plans have not yet been submitted for its reconstruction.